A new report shows just how Africa is making an entry into the global fashion arena, with quality handwork and artistic creativity. 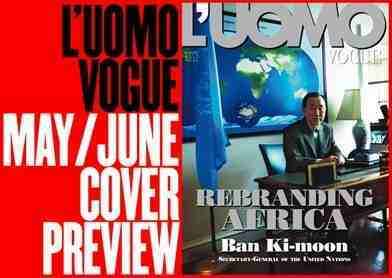 The May edition of Uomo Vogue is an all-Africa magazine with images of beauty and grace. Inside the magazine features an interview with UN Secretary General, Ban Ki Moon advocating a move for Africa from bad news toward positive thinking. Franca Sozzani, editor in chief of Vogue Italia, which dedicated this month’s men ’s wear issue to Africa, has a personal commitment that helps to dispel any idea that rebranding Africa via fashion is a gimmick or that it might sit uncomfortably beside the deep-set issues of poverty, disease, and gender, NYT reports. The concept of small projects leading to an upgraded image includes not just people, but places: the lush beauty of the continent and its allure as a tourist destination. It also showcases the cinematic creativity of Nollywood, Nigeria’s film industry. In addition to the idea of encouraging investment in the creative professions, Ms. Sozzani hopes that her joyous Vogue celebration will help to bring a shift in attitude.